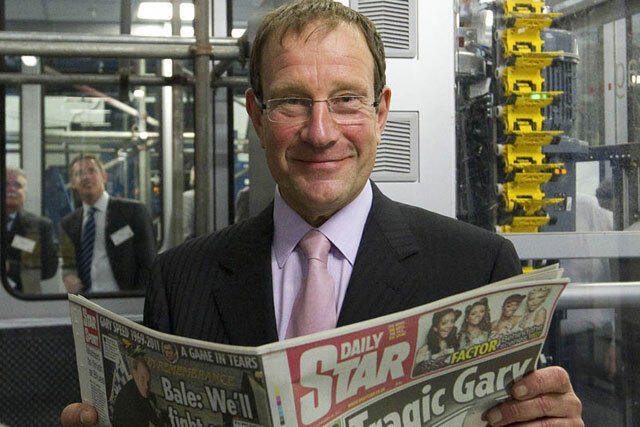 Richard Desmond's Northern & Shell has reported "much improved" trading in the first six months of 2013, fuelled by a double-digit sales lift at Channel 5. In partial financials released by the private company today, Northern & Shell confirmed it experienced a £66 million drop in turnover in 2012 to £622.1 million (2011: £688.8m; 2010: £496.2m). The Channel 5-led media group, which also includes Express Newspapers, OK Magazine and The Health Lottery, lost out in a year dominated by the BBC, with its coverage of Euro 2012 and the London 2012 Olympics. Channel 5 showed total turnover for 2012 of £325.7 million, down from £356.3 million in 2011. The N&S Group reports it ended 2012 with a "healthy cash balance" of £34.5m and no external bank borrowings. Operating losses had been pared back to £5.6 million, down from £20.8 million in 2011. However, airtime sales revenue at Channel 5, home to Big Brother, World’s Toughest Trucker and Cowboy Builders, are reported to have enjoyed a "double-digit" increase in the first six months of this year, contributing to operating profits of £20.6 million for the period. Investment in new programming - including an increased number of in-house productions and commissions to independent producers – are said to remain "on track" across Channel 5’s key audience demographics. Robert Sanderson, group finance director of Northern & Shell, said: "We are greatly encouraged by the turnaround in our trading results in the first half of this year and are confident that we will continue to build on this much-improved financial performance." In print, despite continued pressures on circulations and competitor activity, Express Newspaper Group revenue remained robust, and pre-exceptional operating profits increased by £10m to £18m, assisted by increased efficiencies from the group's new printing presses in Luton and savings on newsprint. Today's statement failed to split out financial figures for its weekly celebrity magazines OK!, New! and Star, opting instead to state they had "consolidated the group’s market-leading position, comprising three of the top four newsstand titles in this category". N&S Group also stated a commitment to its ongoing digital investment programme of "in excess of £25 million", targeting digital transformation across its portfolio of media assets. N&S Group's online properties are said to have seen "rapid growth", with the combined traffic on all the group’s print titles totalled more than 100 million monthly page impressions in July. Growth across its mobile apps is reported to be up by more than 25% in the first half of the year, while page impressions across Northern & Shell websites have "more than doubled since January", helping digital ad revenues to increase by 156%. Channel 5 online is now available on 15 platforms including YouView, iPad and Android, and an average of 10 million long-form videos have been viewed every month since the beginning of the year. Elsewhere, Northern & Shell continued to invest in The Health Lottery in the period, including doubling the number of prizes, developing additional online games and expanding its retailer network. The business, which the company was keen to stress "remains in the investment phase", delivered further operating losses of £15.2m for the six months to June 2013. Since launching in 2011, The Health Lottery has helped raise more than £37m to fund more than 800 local health causes. Players have won over £60m in prizes and in August 2013 The Health Lottery celebrated its one-millionth winner. An N&S statement said: "We remain fully committed to continuing to help local health causes." Will Northern & Shell's cross-media gambit work?